The HydraFacial™ Skin Solutions are clinically formulated to target specific skin conditions, including wrinkles and fine lines, uneven skin tone and texture, clogged or enlarged pores, sun damage, and hyperpigmentation. The best part – it is not a quick fix-it; the HydraFacial™ improves the quality of skin, actually helping to make it healthy. A multi-action specialized skin solution that cleans skin deeply while softening sebum and impurities to aid in extractions. A Beta Hydroxy Acid formula that is ideal for oily or congested skin, and used to dislodge impurities during extractions. An antioxidant-rich skin solution that helps combat free radicals and environmental damage to the cells. A Glycolic and Salicylic Acid combination peel that provides the benefits of a peel with speed, comfort, and virtually no post-peel scaling. This uniquely formulated combination of peptides is designed to help stimulate collagen production and improve cell structure strength. The HydraFacial MD® Daily Essentials™ kits combine the best parts of a HydraFacial™: superior moisture, revitalizing antioxidants, and ultimate protection. 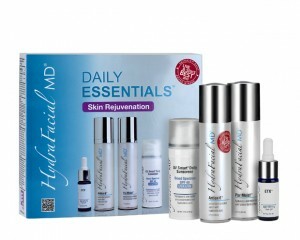 The combination of these essential products can help you achieve Skin Health For Life™! And just like the HydraFacial™, the HydraFacial MD® Daily Essentials™ kit works on every skin type and delivers amazing results. Deeply moisturizes skin with proprietary Hyaluronic Acid and detoxifies skin through antioxidants such as Vitamin A, E, White Tea Extract, Horse Chestnut Seed Extract, and Rosemary Leaf Extract. These powerful ingredients improve the texture and clarity of skin, combat free radicals, and lavishly hydrate skin. 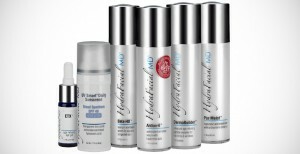 Rejuvenating moisturizer that maintains the luxurious hydration achieved from a HydraFacial™ treatment. Pur Moist™ contains proprietary Hyaluronic Acid, specially formulated with low molecular weight for better absorption. In addition, it is fortified with an antioxidant complex for added protection. Addresses dark under-eye circles and puffiness, as well as fine lines around the eyes. This gentle yet effective formula contains powerful ingredients like Seaweed Extract for soothing, Hyaluronic Acid for hydration, and Soy Peptides to help strengthen the collagen and elastin in this delicate area. UV Smart® Daily Sunscreen SPF 40 contains the powerful active ingredient Zinc Oxide. It is oil-free and paraben-free, and helps protect against the damaging effects of UVA and UVB exposure. The antioxidants Vitamins C, E, and Hyaluronic Acid help address sun damage and combat free radicals. The dual-peptide formula in DermaBuilder™ Dailycontains the same performing ingredients found in a DermaBuilder™ HydraFacial™ treatment. This uniquely formulated combination of peptides is designed to help stimulate collagen production and improve cell structural strength. DermaBuilder™ Daily helps smooth the appearance offine lines and wrinkles, enhances skin elasticity, and helps even skin tone and texture. 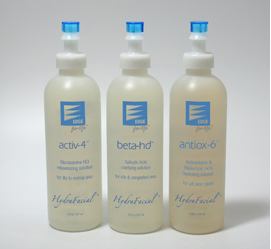 Beta-HD™ Daily is specially formulated to work with oily or congested skin because the natural Salicylic Acid helps soften sebum and dislodge dead skin cells. This does not leave skin feeling dry, thanks to the added Honey Extract for the perfect touch of moisture. Skin will be visibly rejuvenated by this non-irritating formula that deeply cleans oily skin.